At this point, at the very beginning of this post, I need to come clean. I was born in the fifties. I was a sixties child . . . prone to question at the very least, if not loudly reject the status quo, fashion, style and philosophy of anyone over thirty. And that was before I turned eighteen. I was not fond of the blond furniture in my parent’s bedroom. I turned my nose up at anything made of plastic including the avocado green plastic strainer that I was given for my birthday. Ironically and thankfully, I used the avocado green plastic strainer without admiring it until it partially melted down a few years ago. I realized, at that moment, that my distaste for its color and composition had long since faded away. Instead, it was a symbol of a very happy moment with a truly great human. Funny how history plays with memory. I appreciate the craft of carpentry. I admire not only well-crafted, beautifully designed pieces but also, I enjoy country pieces – by which I mean, a piece of furniture made by a householder who needed a place to put the plates or a place to sit. I like the patina especially of really old furniture. So, naturally, I did not enjoy the plastic covering on the sofa, on the seats of my Dad’s 1959 Galaxie 500, nor the plastic “runners” that were stretched over endless expanses of wall to-wall carpeting. Much less, melamine which I considered the bane of civilized society. In short, then, I am admitting a long standing distaste, if not a real prejudice, for anything that smacked of the streamlined and plasticized world of the mid century. That was until I discovered that other world – the world of Eames and Knoll. All bets were off when I experienced writing while sitting in the propeller chair that I found quite by accident. (In fact, the manager of the establishment was sitting in the chair when I asked if it was for sale. I was delighted when he said, yep. And he meant it!) This was the first chair that I could sit in for hours and not develop a dull ache in my lower back. Now, I can also recommend Herman Miller shell chairs and Steelcase to anyone who knows exactly what I am talking about. 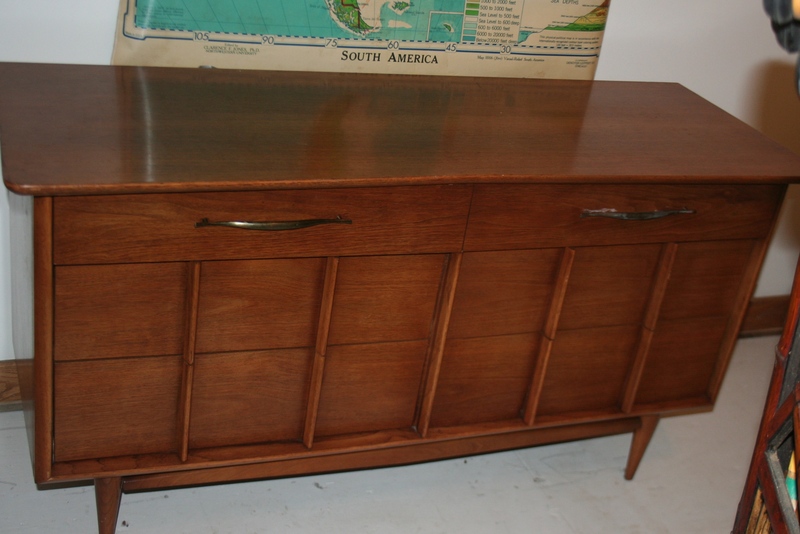 The Kent-Coffey buffet/server/dresser that we have is another truly spectacular piece of furniture. Not only do the drawers glide when opened like Ginger Rodgers across a dance floor but the vertical design element catches light and shadow like sculpture. It is crafted with precision and the finish is equally amazing. A little Danish Oil refreshes the finish as if it was made last year. Finally, yet another bit of irony. I now appreciate the plastic slip covers – especially when I find them on an upholstered piece in the old neighborhood. Take off that plastic sixty years later and you will might just have a “brand new” piece of furniture!